We have this tradition of buying a 'first doll' on the second solstice/christmas. (Gosh, writing that out it sounds so random). We get them locally, but from the Q'ewar Project, which assists women in Peru. (I blogged about Ezra's 'Stanley' here.) Everytime I post about these dolls I get emails reminding me that I could make them myself. Perhaps (and that's a big perhaps! ), but they would be nothing like these gorgeous dolls made by such experienced women. They're beautiful. So anyway, this is Adelaide's year for her doll. And I want to make a doll quilt to give her too, one that will last perhaps beyond this first doll into others (if she's interested in doll play, of course). 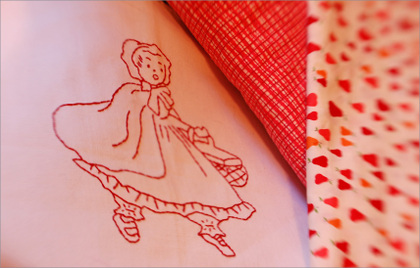 I completed this Little Red Riding Hood redwork early this summer, thinking it would be the center of said doll quilt. But so far, these are the only two fabrics I've gathered to use. I can't stop thinking about the old Munki Munki Little Red Riding Hood fabric and how great it would be to back the whole thing in that. I can't find a picture of it online anywhere - do you remember that one? So, so cute, and I'm kicking myself for not picking some up then. But you see, now that THAT fabric is in my head, I can't imagine anything else as the back and so now I'm frozen on the project. And now December is looming. So yeah, I know...move on, Amanda. Or, as my dear sweet husband now says, "make it work." (I love that he loves Tim).